Raising their voices: Nguyen Thi Thom (middle) and her students during a singing session. An old man in the northern province of Bac Ninh has ridden his bicycle to various villages, collecting old folk tunes, for the past 50 years. Today, assisted by his wife, he is nurturing young talents to keep this music genre alive. Do Thu and Trung Hieu report. Nguyen Van Quyen and his wife Nguyen Thi Thom teach a small class every day, diligently guiding talented youngsters in the art of quan ho. 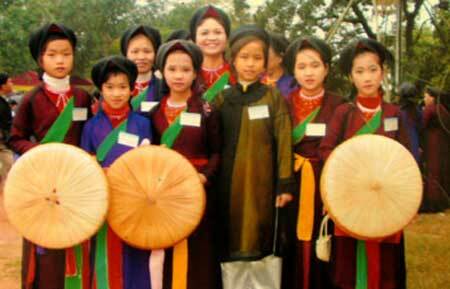 Quan ho, or love duets from Bac Ninh Province, is a famous style of folk music. Festivals featuring this genre are held in the springtime, giving young men and women a chance to meet and perform love duets. The locals often affectionately refer to the elderly couple as "quan ho teachers." Arriving in Kim Chan Commune in Kim Doi District of Bac Ninh, we asked where we could find the couple and were enthusiastically guided on our way. From a distance, we could hear children singing folk tunes. Upon spotting us, the couple put the class on hold to welcome us. The children eagerly ran into the kitchen to help them boil water for tea. Thom laughed, noting that their house was always this noisy. 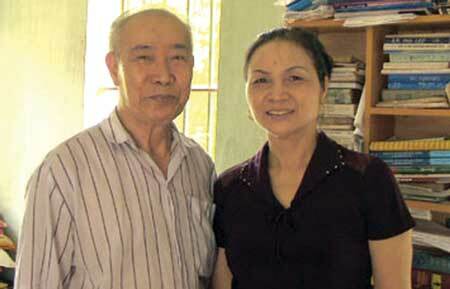 Her husband, Quyen, at the age of 80, appears gentle and kind. With a lifelong career as an elementary school teacher under his belt, Quyen finds this lifestyle of teaching and coaxing young pupils all too familiar. After retiring from his job, he did not expect to continue teaching. The only difference is that no one pays him a monthly salary now; he maintains the classroom himself. Drawing on their love of teaching children the arts, the couple started the music class. Sometimes, they offer their pupils small gifts, such as cake, candy and oranges. The couple set up the first training group for singing folk songs, with a special focus on attracting primary school children in Bac Ninh. Starting out in Kim Chan, they extended their services to many different communes, kicking off a movement around the province. Quyen was born in a rural area, where everyone grew up listening to these folk songs. In the springtime, after teaching at the school, he would attend music festivals being held in nearby villages. Since childhood, collecting these folk songs has been his hobby. When the country was at war, many of these tunes disappeared from the collective memory, making Quyen realise the importance of his collection. "If nobody preserves them, after only a few dozen years, when the elders have gone, who will preserve this part of our heritage for future generations?" he asked. This concern prompted Quyen to make regular trips to the villages, seeking out old folk song masters, so he could record their songs. "When the country was being pounded with bombs, I was still riding a bicycle, fearing for both my life and my collection," he recalled with a smile. More than 50 years have passed, and his collection now consists of more than 1,000 songs. After retiring from the school, Quyen launched singing classes for the elders in the village. He focused on teaching them the basic styles and melodies that few people know, so his classes were always crowded. Then, he began classes for children. "Most of the people in Bac Ninh love quan ho. But my dream would not have become a reality without the presence of this woman, who entered my life when I was already an old man," Quyen said of his wife. Thom is 20 years younger than Quyen. Her first husband had divorced her, leaving her to raise their two daughters alone. Once her daughters were married, Thom found she had free time to learn to sing folk songs. She has loved this music since she was a girl, but her family was poor, so she never had the chance to study it until she was much older. When her cousin asked her to join Quyen's classes, she immediately agreed. When Thom entered his house for the first time and saw the 60-plus-year-old man surrounded by clunky furniture, with no one to prepare his meals, she felt the deepest compassion for him. Thom asked Quyen about his background and learned that his wife had passed away over a decade ago. He also had diabetes, which made many women afraid to marry him. On hearing his story, Thom committed to taking care of him in small ways. She would come over to help him with his housework, wash his clothes or even cook his meals. Over time, their feelings for each other deepened. Their children from their previous marriages enthusiastically supported the two elders as they formed a relationship. In their small house on the bank of the canal, the two senior citizens have pledged to live out their days together. Understanding Quyen's passion, Thom decided to learn to use a computer and develop musical notation skills to help him compile a book of music. Since she was more than 50 years old at the time, Thom was slow to pick up these new skills, and her hands were stiff while typing. She had to exercise great patience while learning to use the computer. Every evening, Quyen dictates lyrics for Thom to transcribe. So far, they have recorded more than 400 songs, making them ready for publication. Their life savings combined with presents from their children totalled more than VND30 million (almost US$1,400), which they spent on printing the book. Finally holding the book in their hands for the first time, even though it was not beautifully decorated, the couple could not hide their joy. They proudly presented it to relatives and friends. Apart from taking care of her husband, Thom also teaches the children to sing. Their first commission came from the administrators of the commune's primary school: They were invited to teach the pupils to sing a song that would be performed during the school's festival. Some 20 children attended these sessions and expressed great enthusiasm for learning the song, leading the elderly couple to establish the Mang Non (Bamboo Shoot, refering to younger generation) Club. Quyen noted that he was afraid the children would become so focused on singing that they would forget to study, so he bore the responsibility of becoming their "volunteer tutor" as well. Seeing the children sing so well while making progress in their schoolwork made their parents very happy. Some people from other communes also sent their children to learn songs at the club. Gradually, a movement was formed across all the communes of Bac Ninh, attracting hundreds of people to join. When we visited the couple, their small house and simple furniture really impressed us. They are poor but in earnest. "We are saving some money from our pension and will combine it with gifts from our children to publish a second book containing 1,000 quan ho tunes," said Thom.